I looked at Cade and explained the situation. His imploring eyes held just a hint of panic, as if he knew a difficult decision was about to be presented. I put my hand on his shoulder. I paused. Thought it over. Gave it the old parenting reconsideration, including the Bill Cosby mouth wrinkle. The words barely left my Skittle-stained tongue before he had a lollipop unwrapped and in his mouth. 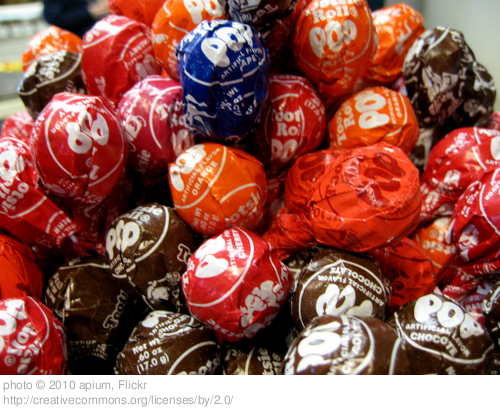 How many licks does it take to get to the center of a Tootsie Roll Tootsie Pop? Driving out of the city the other day, I thought about how much I love it there. Especially when the temperature gets colder. There’s something satisfying about writing in a city cafe, people in and out, cold air blowing in through the door, and everyone scurrying past the large glass windows. Then I got home and was amazed at the natural beauty of the countryside. Tall, golden-leaf trees droop over our quarter-mile long driveway, a tunnel of Autumn. The muffled silence that swallowed up the sound of my slamming car door surrounded me like an empty page. Choices. It’s so easy to forget that just about everything we have, everything we do, and everywhere we are is a choice. And even when it comes to those rare things that we do not have any say about, we can still choose our response. Every choice we’ve made for something also represents a choice made against something else. I choose to live here, in the country, which is also a choice against the city. I choose to spend my money in a certain way, which is also a choice not to spend it for other things. I choose to live my life doing certain things, being certain things, but I’m also actively choosing against the alternatives. Cade was disappointed when we got out to the car and his sister picked out one more piece of candy while he was left with the memory of sweets already eaten. Are there areas of your life where you are making passive decisions, forgetting about the things being sacrificed in the process?